Death was a constant companion to those serving in the line, even when no raid or attack was launched or defended against. In busy sectors the constant shellfire directed by the enemy brought random death, whether their victims were lounging in a trench or lying in a dugout (many men were buried as a consequence of such large shell-bursts). Similarly, novices were cautioned against their natural inclination to peer over the parapet of the trench into No Man’s Land. 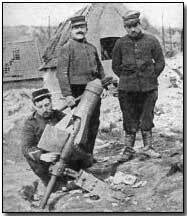 Many men died on their first day in the trenches as a consequence of a precisely aimed sniper’s bullet. It has been estimated that up to one third of Allied casualties on the Western Front were actually sustained in the trenches. Aside from enemy injuries, disease wrought a heavy toll. Rats in their millions infested trenches. There were two main types, the brown and the black rat. Both were despised but the brown rat was especially feared. Gorging themselves on human remains (grotesquely disfiguring them by eating their eyes and liver) they could grow to the size of a cat. Men, exasperated and afraid of these rats (which would even scamper across their faces in the dark), would attempt to rid the trenches of them by various methods: gunfire, with the bayonet, and even by clubbing them to death. It was futile however: a single rat couple could produce up to 900 offspring in a year, spreading infection and contaminating food. The rat problem remained for the duration of the war (although many veteran soldiers swore that rats sensed impending heavy enemy shellfire and consequently disappeared from view). Rats were by no means the only source of infection and nuisance. Lice were a never-ending problem, breeding in the seams of filthy clothing and causing men to itch unceasingly. Even when clothing was periodically washed and deloused, lice eggs invariably remained hidden in the seams; within a few hours of the clothes being re-worn the body heat generated would cause the eggs to hatch. Lice caused Trench Fever, a particularly painful disease that began suddenly with severe pain followed by high fever. 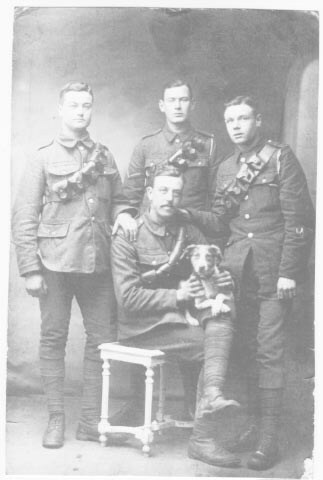 Recovery – away from the trenches – took up to twelve weeks. Lice were not actually identified as the culprit of Trench Fever until 1918. Frogs by the score were found in shell holes covered in water; they were also found in the base of trenches. Slugs and horned beetles crowded the sides of the trench. Many men chose to shave their heads entirely to avoid another prevalent scourge: nits. Trench Foot was another medical condition peculiar to trench life. It was a fungal infection of the feet caused by cold, wet and unsanitary trench conditions. It could turn gangrenous and result in amputation. Trench Foot was more of a problem at the start of trench warfare; as conditions improved in 1915 it rapidly faded, although a trickle of cases continued throughout the war. Typically, a battalion would be expected to serve a spell in the front line. This would be followed by a stint spent in support, and then in reserve lines. A period of rest would follow – generally short in duration – before the whole cycle of trench duty would start afresh. In reality the cycle was determined by the necessities of the situation. Even while at rest men might find themselves tasked with duties that placed them in the line of fire. Others would spend far longer in the front line than usual, usually in the more ‘busy’ sectors. As an example – and the numbers varied widely – a man might expect in a year to spend some 70 days in the front line, with another 30 in nearby support trenches. A further 120 might be spent in reserve. Only 70 days might be spent at rest. The amount of leave varied, with perhaps two weeks being granted during the year. The daily routine of life in the trenches began with the morning ‘stand to‘. An hour before dawn everyone was roused from slumber by the company orderly officer and sergeant and ordered to climb up on the fire step to guard against a dawn raid by the enemy, bayonets fixed. This policy of stand to was adopted by both sides, and despite the knowledge that each side prepared itself for raids or attacks timed at dawn, many were actually carried out at this time. Accompanying stand to, as the light grew, was the daily ritual often termed the ‘morning hate’. Both sides would often relieve the tension of the early hours with machine gun fire, shelling and small arms fire, directed into the mist to their front: this made doubly sure of safety at dawn. With stand to over, in some areas rum might then be issued to the men. They would then attend to the cleaning of their rifle equipment, which was followed by its inspection by officers. Breakfast would next be served. In essentially every area of the line at some time or other each side would adopt an unofficial truce while breakfast was served and eaten. This truce often extended to the wagons which delivered such sustenance. Truces such as these seldom lasted long; invariably a senior officer would hear of its existence and quickly stamp it out. Nevertheless it persisted throughout the war, and was more prevalent in quieter sectors of the line. With breakfast over the men would be inspected by either the company or platoon commander. Once this had been completed NCOs would assign daily chores to each man (except those who had been excused duty for a variety of reasons). 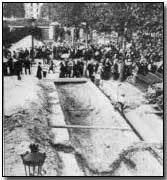 Example – and necessary – daily chores included the refilling of sandbags, the repair of the duckboards on the floor of the trench and the draining of trenches. 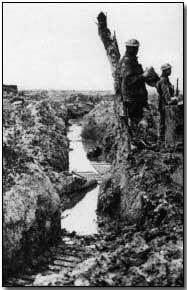 Particularly following heavy rainfall, trenches could quickly accumulate muddy water, making life ever more miserable for its occupants as the walls of the trench rapidly became misshapen and were prone to collapse. Pumping equipment was available for the draining of trenches; men would also be assigned to the repair of the trench itself (click here to view brief film footage of British troops pumping water from trenches in 1914). Still others would be assigned to the preparation of latrines. Given that each side’s front line was constantly under watch by snipers and look-outs during daylight, movement was logically restricted until night fell. Thus, once men had concluded their assigned tasks they were free to attend to more personal matters, such as the reading and writing of letters home. Meals were also prepared. Sleep was snatched wherever possible – although it was seldom that men were allowed sufficient time to grab more than a few minutes rest before they were detailed to another task. With the onset of dusk the morning ritual of stand to was repeated, again to guard against a surprise attack launched as light fell. This over, the trenches became a hive of activity. Supply and maintenance activities could be undertaken, although danger invariably accompanied these as the enemy would be alert for such movement. Men would be sent to the rear lines to fetch rations and water (click here to view film footage of British soldiers receiving rations in 1914). Other men would be assigned sentry duty on the fire step. Generally men would be expected to provide sentry duty for up to two hours. Any longer and there was a real risk of men falling asleep on duty – for which the penalty was death by firing squad. Patrols would often be sent out into No Mans Land. Some men would be tasked with repairing or adding barbed wire to the front line. Others however would go out to assigned listening posts, hoping to pick up valuable information from the enemy lines. Sometimes enemy patrols would meet in No Man’s Land. They were then faced with the option of hurrying on their separate ways or else engaging in hand to hand fighting. They could not afford to use their handguns while patrolling in No Man’s Land, for fear of the machine gun fire it would inevitably attract, deadly to all members of the patrol. Men were relieved front-line duty at night-time too. Relieving units would wind their weary way through numerous lines of communications trenches, weighed down with equipment and trench stores (such as shovels, picks, corrugated iron, duckboards, etc.). The process of relieving a line could take several frustrating hours. Finally, no overview of trench life can avoid the aspect that instantly struck visitors to the lines: the appalling reek given off by numerous conflicting sources. Rotting carcases lay around in their thousands. For example, approximately 200,000 men were killed on the Somme battlefields, many of which lay in shallow graves. Overflowing latrines would similarly give off a most offensive stench. Men who had not been afforded the luxury of a bath in weeks or months would offer the pervading odour of dried sweat. The feet were generally accepted to give off the worst odour. Trenches would also smell of creosol or chloride of lime, used to stave off the constant threat of disease and infection. Add to this the smell of cordite, the lingering odour of poison gas, rotting sandbags, stagnant mud, cigarette smoke and cooking food… yet men grew used to it, while it thoroughly overcame first-time visitors to the front.